In 1795, William Blake decided to offer twelve large colour prints, made using a process similar to monoprinting, in which he laid a coloured design out on a flat surface, and brought paper into contact with the wet paint or ink in order to transfer some of that onto the paper. He chose a mixture of images for these prints: some were based on existing designs which he had made for his previous illuminated books, and some were original to this series. His aim was to sell more than one copy of each print, but making more than three impressions from any single original was unlikely, as their quality deteriorated after the first print had been made. In all, twenty-eight prints are known of the series of twelve, showing that he got two or three impressions of each. It is now generally agreed that Blake’s intention was to depict Shakespeare’s two similes for pity using imagery which matched his words literally, thus to evoke the concept of pity in exactly the same terms as in Macbeth’s speech. This first impression is the finest-detailed of the three surviving prints made by Blake (the second is shown later). Having made the monoprint, most probably using watercolour paints on millboard, Blake finished each by hand, using pen and ink, and watercolour paints. Pity has a strongly horizontal linear design. The upper half of the painting consists of the long image of a pair of superimposed white horses, galloping through the air with their eyelids closed, on which there are two riders. The nearer rider reaches down with both arms to raise a miniature human figure (not having the proportions of an infant), and the further figure faces away from the viewer, their arms outstretched along the length of the horses. The lower half of the painting contains a woman lying on her back, her head at the left and thrown back. Her hands are clasped together on her chest, and from the level of her armpits down she is wrapped in a white or grey funeral shroud. Thus, Shakespeare’s “naked new-born babe” is the miniature human being raised by the nearer horserider, the “blast” is shown by the horses’ manes and tails, and the rider’s hair, “heaven’s cherubim” are the two riders on the horses, and the “sightless couriers of the air” are the horses with their eyelids closed. 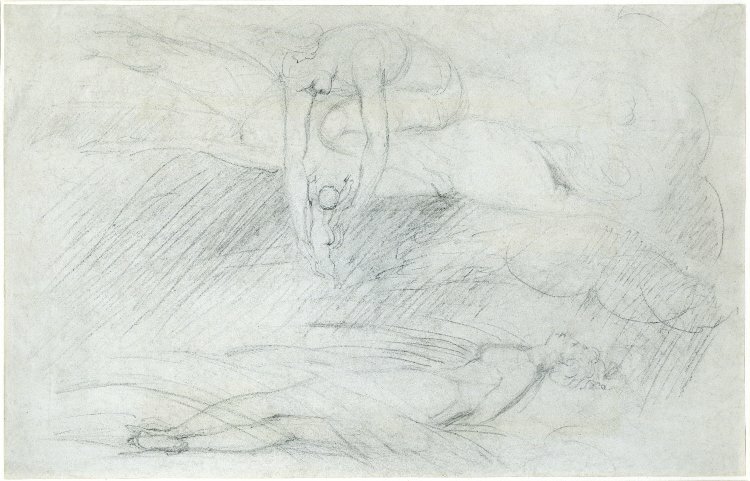 Two of Blake’s preparatory sketches have survived, and a trial proof (image not available for use here). Because the eventual painted prints were made using a monoprint process, these sketches share the left-right layout of the ‘plate’, and are reversed when compared with the prints made from it. 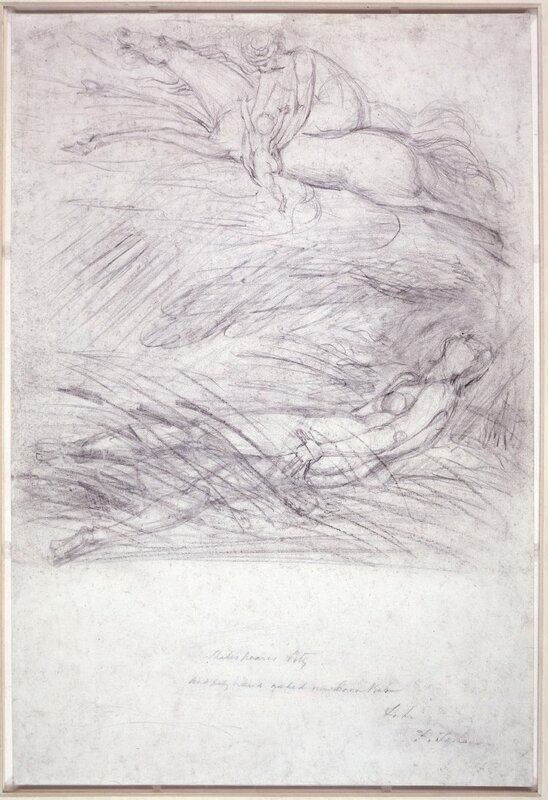 William Blake (1757–1827), Sketch for the large colour print ‘Pity’ (first, recto) (c 1795), graphite on paper, 41.7 x 28.3 cm, The British Museum (Donated by John Deffett Francis), London. Courtesy of and © Trustees of the British Museum. The earlier sketch in the British Museum places the paper in ‘portrait’ orientation, and it is this which suggests that this was an early painting in the series, if not the first. Blake’s design here lacks the strong linearity of the final work, with the lower woman apparently having just given birth to the baby, among rushes or reeds. Only one cherub appears on a single horse. William Blake (1757–1827), Sketch for the large colour print ‘Pity’ (second, recto) (c 1795), graphite on paper, 27.2 x 42.2 cm, The British Museum, London. Courtesy of and © Trustees of the British Museum. The second sketch in the British Museum is much closer to the finished work, although it is still not as linear in composition. The lower woman is more horizontal, and her head is now thrown back, although her body is rotated away from the viewer. There is still only a single rider on one horse, which is also more horizontal. In the final stages, Blake strengthened the horizontal composition further, laid the lower woman out as if already dead, adjusted the posture of the rider, and added a second horse and rider to conform to the text “cherubim” and “couriers”. William Blake (1757–1827), Pity (c 1795), relief etching, printed in color and finished with pen and ink and watercolor, 42.2 x 52.7 cm, The Metropolitan Museum of Art (Gift of Mrs. Robert W. Goelet), New York, NY. Courtesy of The Metropolitan Museum of Art. The second impression of the final painted print, in the collection of The Met in New York, shows some small differences from the first (in the Tate in London). Most significant of these is the abbreviation of the shroud on the lower woman’s chest, so as to expose her right breast. A third impression is in the Yale Center for British Art in New Haven. 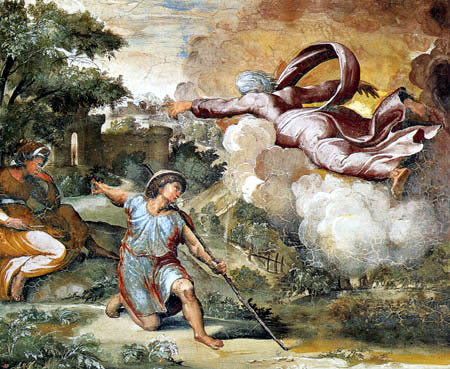 Blunt has drawn attention to the visual similarities between the second rider, added after the second sketch, and the figure of God in a fresco painted by Raphael in the Vatican in the early sixteenth century (remember that this too needs to be left-right reversed for comparison with the painted prints). Raphael (Raffaello Sanzio da Urbino) (1483-1520), God Appearing to Isaac (1518-19), fresco, dimensions not known, Loggia di Raffaello, Vatican. Source of image not known. As Blake never left the British Isles, he clearly could not have seen the original, but a contemporary engraving made by Marco Dente da Ravenna shows the image even more clearly. 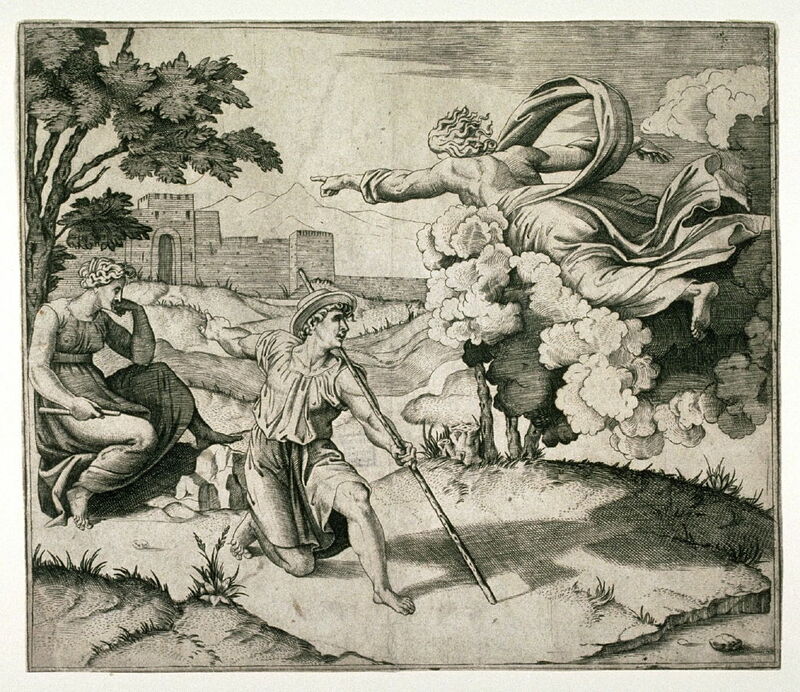 Marco Dente da Ravenna (1493-1527) after Raphael (1483-1520), God Appearing to Isaac (after 1518), engraving, print 20.6 x 24 cm, Fine Arts Museums of San Francisco (Achenbach Foundation), San Francisco, CA. Courtesy of Fine Arts Museums of San Francisco. Given Blake’s long experience as an engraver, and his great interest in Raphael’s frescos, Blunt considers it quite plausible that Blake may have copied the second figure from this print (or a later reproduction of it). 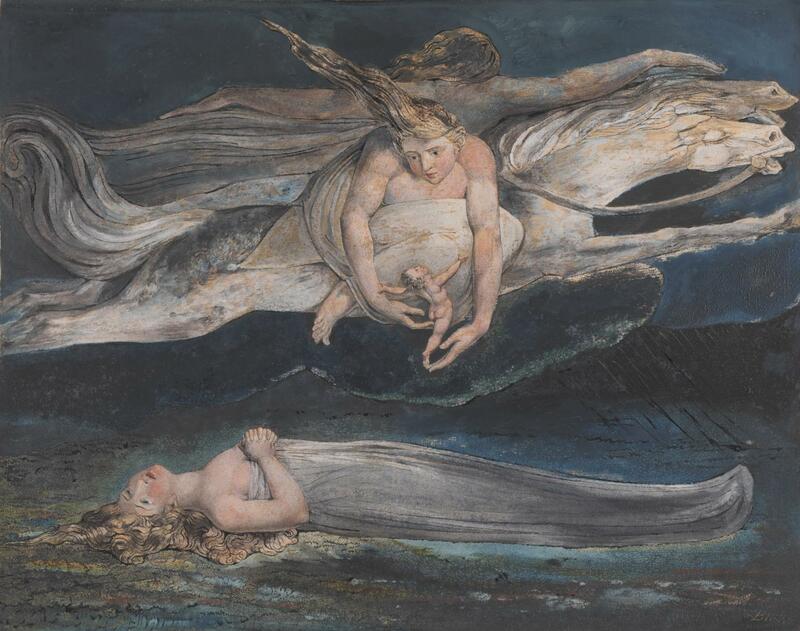 Pity also contains common visual elements with some of Blake’s other paintings. 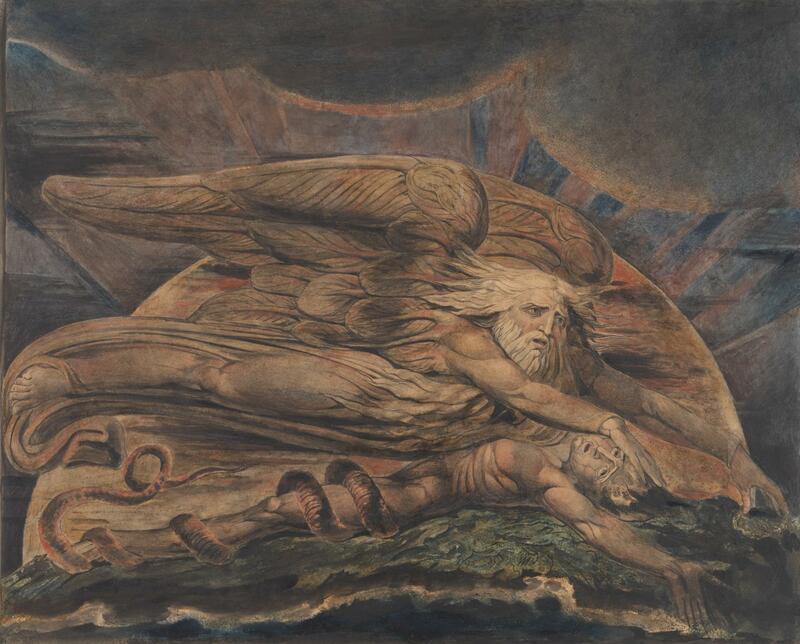 Blake’s contemporary Elohim Creating Adam (1795, c 1805) features a similar horizontal linear composition, placing Elohim above Adam. 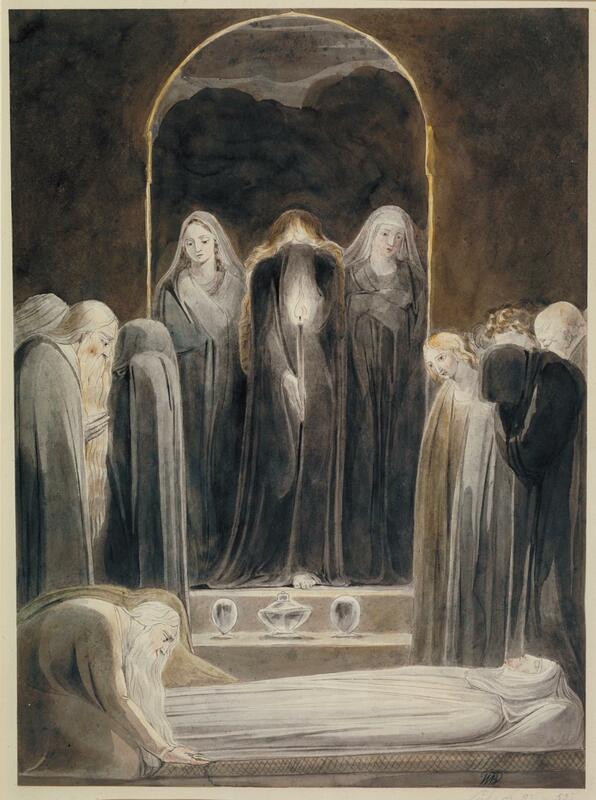 Similar images of horizontal bodies in shrouds appear in several of Blake’s works, notably the later The Death of the Virgin (1803) and The Entombment (c 1805), where they are also in the lower part of the composition. Those differ from that in Pity, in that the shroud is wrapped fully around the bodies and heads, and their arms are at their sides. This suggests that Blake wants us to see the lower woman in Pity as not yet dead, but probably dying after childbirth, a tragically common event in his day. 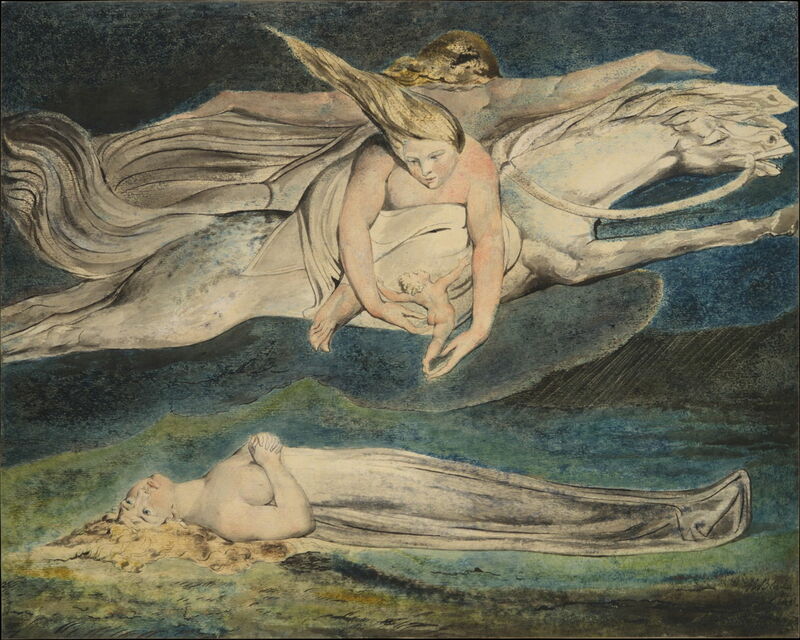 Of Blake’s more easily-read paintings, this is one of my favourites. Its composition is bold and striking, and the figures finely executed. The idea of turning Shakespeare’s words into the graphic elements is original, and successful in expressing this otherwise tough abstract concept. The painting contains one remaining mystery, though: Blake elsewhere demonstrates that he is perfectly capable of depicting babies which are fairly true to nature. There is nothing in Shakespeare’s text which might have driven him to show “a naked new-born babe” in this anachronistic way. I wonder whether he chose to do so to remain faithful to his quoted style of Raphael and early painting. Posted in General, Language, Painting and tagged Blake, Macbeth, painting, Raphael, Shakespeare. Bookmark the permalink.